The fix was in 2.1.3.x test builds and is also in 2.1.4/2.1.5 releases. Great extension. but I have two questions or suggestions for updates. 1. Is it possible to increase the space between the tabs and top of window? I would ideally add 3-4 extra pixels to make is more visually pleasing (to my taste, I know) and make it easier to grab and move around the window. If you have a userChrome.css modification to suggest, that's fine too. – Configure the "Hide Lightning buttons" so that when it is checked, it also hides the Cardbook (and maybe other similar) icons. – Allow the menu to be moved to the left side (where it should be anyway) but keep the Lightning buttons to the right side of the menu/tab bar. 1. Recent CMB versions offer a "custom CSS" box where you can add your code instead of using userChrome.css. Try this one to add more space above tabs in normal window mode. 2.1 I can extend that option to hide all buttons incl. card button (excl. menu button) on next update. 2.2 Its not possible to split the box into two boxes to achieve what you are requesting without loosing some appbutton features. Thanks for the bit of CSS code. Regarding improvements, option 2.1 would be great. Release 2.4.1 contains above's "2.1" fix. I have CustomizeMyBird 2.4.1 currently installed on Thunderbird 56. My OS is Windows 7 Pro (64 bit) SP1. I plan to install it later on Thunderbird 60. In Options> General IU sectton. I have set the Main Menu bar above the tabs. IF I do NOT check 'Windows header colors', then when I move my mouse over the Main menu entries (File, Edit, View, etc.) there is no highlight added. One just does a left mouse click to select one of the options. However, if I check 'Windows header colors', then when I move my mouse over the Main menu entries, there is a dark blue highlight that appears. This means I cannot specify black text, because it is then unreadable. Why do I get this dark blue highlight when I select 'Windows header colors', and is there some way to eliminate the highlight? A second question. Unlike some of my other addons, CustomizeMyBird does not appear in the dropdown menu when I select 'Tools' from the Main menu (or if I can set this feature, I cannot find it). Those that do have their addons listed in the dropdown menu have their 'Options' in a popup window over the main screen. That means one can make changes, and see immediately what the effect is. In CustomizeMyBird, I am forced to open the Addons Manager, then open CustomizeMyBird options, make a change, and then reverse my steps so I can see what actually changed. Is there some way to have CustomizeMyBird appear in the dropdown menu when I select 'Tools' from the Main menu? This is a great addon, and I really appreciate it being created. I am just trying to make it better and easier for me to use. I'm sorry, but Thunderbird 53-59 are not supported anymore. Especially 53-57 are heavily buggy and do not correspond well with some ui changes. 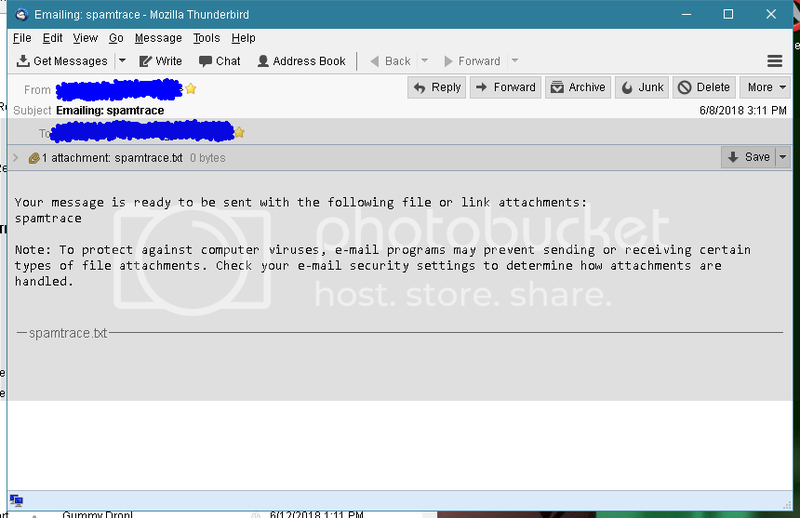 Either use Thunderbird 52ESR or Thunderbird 60/60.1. Repeat your tests with TB 60 and report back, if the issues still do exist. 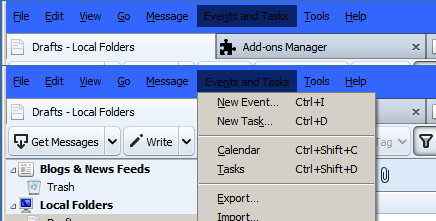 I did not add any entry to Tools menu, because older versions (pre-2.0) could only be accessed through add-on page and 2.0 was mainly developed for Thunderbirds 58+ ui changes, that were finalized in Tb60. In Tb58+ all add-on settings are accessible through Tools > Add-on settings menu. Thanks for the very prompt reply. As it turns out, I do have Thunderbird 60.0 (32 bit) on another Windows 7 Pro (64 bit) SP1 computer. So I installed CustomizeMyBird 2.4.1 on it. I set the CustomizeMyBird settings exactly the same as the installation for Thunderbird 56 on my other computer. Unfortunately the problem is exactly the same. I did try lots of other changes to see if they might affect whether the dark blue highlight occurred or not, but nothing I tried helped. Why do I get this dark blue highlight when I select 'Windows header colors', and is there some way to eliminate the highlight? Is there an easy way for me to send you all of my settings, so you can see if you can duplicate the problem? I appreciate your adding CustomizeMyBird to the Tools dropdown, and that does make it easier to switch back and forth between tabs. Perhaps in a future update you could put it in a pop-up resizable box, so both could be seen simultaneously. I always suggest to provide screenshots showing the actual issue. That way I might already see the basic OS/UI configuration and tell right away what might be responsible for the glitch or issue. Otherwise I have to go through most common cases and find the issue myself and sometimes I just can't, because third party OS themes or tools like WindowBlinds are active. The highlight is not getting changed by CMB, you see the default one the OS theme provides. Thanks for the post. I should have provided images: sorry. And as you showed, the text was unreadable. And that is what I am using now. But in your bottom image, you set custom caption background color to #000000. I cannot get an entry there to change the background color, no matter what I set it too, including the default: rgba(211,211,211,0.5). Does the Windows OS theme override this background color setting? The "custom caption background color" should be only visible on Windows 10, its present on all systems by mistake. Ignore that option on Windows 7, it does nothing to the ui. I will hide it on next update for other OSs btw. OS versions. Aris wrote: The "custom caption background color" should be only visible on Windows 10, its present on all systems by mistake. Ignore that option on Windows 7, it does nothing to the ui. I will hide it on next update for other OSs btw. OS versions. Thanks for the quick response. No need to rush a fix on my behalf. I don't know how you developers keep track of all the small changes between versions of Operating Systems anyhow. I have two questions today. Hopefully this will be the last time I have to bother you. 2. They are two images here. They are marked #1 or #2 in red circles in the upper right hand corner. In #1, I have opened a single message (the red arrow points to it). That action opens the footer (??) as shown by the green arrow. The footer background is the same gray color as the Quick Filter bar background (as marked by A in the green circle). This gray color is easy on the eyes, and the black text for the icons (I am using Noia (small) icons) can be easily read. Now look at image #2. Here I am looking at a summary of the text in all the 11 messages in this thread. The red arrow points to the thread, and the red circle shows that I have selected the thread. But now the footer (??) as shown again by the green arrow, is Navy Blue: the same color as the background on my Windows 7 computer. Since the icon text is black, it is unreadable. Is there any way in CustomizeMyBird that I can change this Navy Blue background to gray, or some other color? And if not, do you know what the Custom CSS Code might be so that I can enter it at the bottom of CustomizeMyBird? Thanks again for all your help, and a great Thunderbird Add-on.